I never planned on getting her but I fell in love with her. In a way she chose me because she came right up to the cage when I put my hand to it. When I took her home a day later I tried thinking of a name for her it took me hours when I finally had it. 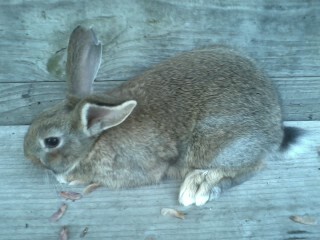 I named her Nudge. Because when I put my hand in her hutch to pet her she loves it but when I stop she nudges my hand. 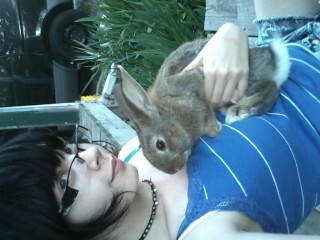 She's a very sweet bunny and I have been trying to figure out what type of beautiful bunny she is but with no avail. She has dark black tips on her ears. White on her feet and underside including her fluffy tail and around her eyes. And she also has very big back feet. She's not fully grown I'd say she's only a month old. She's a very sweet loving bunny and I'd love to know what breed she is or mix, if anyone can help please.